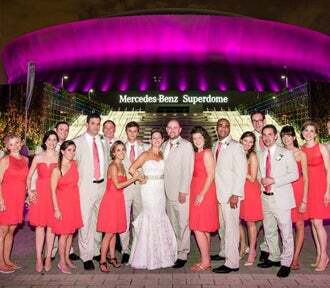 The Mercedes-Benz Superdome is established as a premier destination for every type of event, and the grand structure builds on that legacy continually. From the biggest, most elaborate productions that thrill thousands to memorable intimate gatherings, the Superdome adapts and captivates. Located in the heart of the New Orleans Central Business District, the Superdome is among the most enviable venues in the nation. And with a stunning spot on the New Orleans skyline and its iconic design, the Superdome is one of America’s most recognizable landmarks. The Superdome is not only a key part of the landscape of Louisiana – it’s also a critical piece of the region’s history. In August 2005, the city was ravaged by Hurricane Katrina, and in the wake of the storm, many thought the facility would have to be demolished. In what became the biggest stadium reconstruction project in American history, the Mercedes-Benz Superdome was reborn. It’s reopening was a spark in the city’s post-disaster recovery, and launched a phenomenal rebirth of the sports and entertainment business. With its beauty intact and brilliant lighting, the Superdome is a symbol of the strength of New Orleans, and the city’s enduring spirit and resolve.